Oxbow Alfalfa is a legume forage hay which is high in fibre with increased levels of energy, protein and calcium over grass hays. It is perfect for young and sick or recovering animals which need more concentrated nutrition. Once the animal reaches adulthood or recovers, their forage can be replaced with grass hay. Mixing Alfalfa with grass hay produces a rich, tasty, highly nutritious diet. Alfalfa Hay can be fed daily to growing animals as 25% of their total dietary intake. Adult animals should be limited to a small pinch as a treat. Alfalfa Hay should only be offered carefully to mature rabbits, guinea pigs,chinchillas, and prairie dogs due to the higher protein and calcium content. Many vets believe that animals prone to kidney stones, bladder stones or calcium crystals in their urine should always avoid alfalfa. 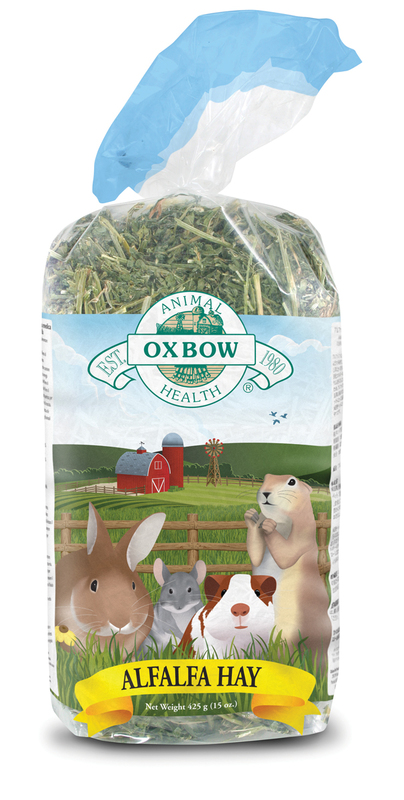 There are currently no questions for Oxbow Alfalfa Hay - be the first to ask one!